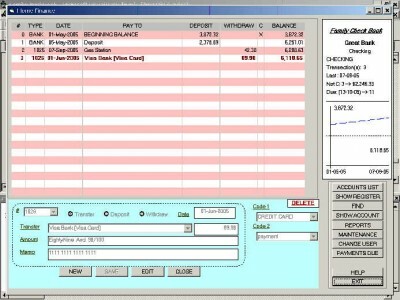 FamilyCheckBook 1.00 is accounting & finance software developed by JM Computing. FamilyCheckBook is a multiple user, simple, easy to use money management and expense tracking tool. Manage all your accounts, track spending habits, transfer among accounts, create reports, and protect your data with password in an easy way. Entering transactions is much like writing a check. With a couple of mouse clicks you can create a report, or switch to another account. Each user can define his own password to protect the data. This business software is shareware, which means you can download and use FamilyCheckBook 1.00 for free during the trial period (usually for 30 days). At the expiration of the period you will have to buy the accounting & finance product for $15.00. FamilyCheckBook 1.00 is available at regnow and JM Computing website. FamilyCheckBook 1.00 supports different languages (including English). It works with Windows 98/XP/Vista. Latest FamilyCheckBook 1.00 does not contain any spyware and/or advertise modules, allowing installing it with no worries concerning valuable information loss. We has completely tested accounting & finance software FamilyCheckBook 1.00 many times, written and published the interesting article and uploaded installation file (2072K) to our fast server. Downloading FamilyCheckBook 1.00 will take minute if you use fast ADSL connection. QuickFinance helps you to manage your personal finances.